Philip Kennedy and Richard Sieburth led a discussion that included Humphrey Davies, Marilyn Booth, Robyn Creswell, and Roger Allen. The books in focus were Leg over Leg, by Aḥmad Fāris al-Shidyāq, edited and translated by Humphrey Davies; and What ‘Isa ibn Hisham Told Us, or, A Period of Time, by Muḥammad al-Muwayliḥī, edited and translated by Roger Allen. The first part of the Session 5 write-up focused on translatability and the texts’ relationships to Europe. An piece on Session 6, the final one of that day, should appear next Monday. One of the Library of Arabic Literature’s commitments is to “wholeness”: hence the completeness of Abū l-ʿAlāʾ al-Maʿarrī’s Epistle of Forgiveness, which had previously been translated only in part. 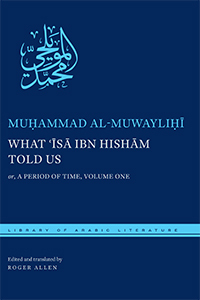 But the LAL edition of What ‘Isa ibn Hisham Told Us doesn’t just restore a complete version of the text. It adds back in material that its author had redacted. What ‘Isa Told Us shrank even more when its fourth edition was chosen as a school text in Egypt. To make it an appropriate exam text, the author edited it down even further. The LAL thus has the potential to shift the discussion of the Arabic corpus in Arabic, although, as discussed in an earlier session, it still wasn’t clear exactly who was reading the LAL books. What came first: the novel or the modern? These two texts both sit near the end of the LAL remit, which encompasses Arabic texts written from the earliest uses of the language up to the early-twentieth-century nahda. Indeed, perhaps what Leg over Leg does best is break down the seeming forward “evolutionary” trajectory of narrative to novel. In any case, both texts help demonstrate the breadth of the LAL’s vision and the sorts of problems the Library is keen to tackle. And the ways in which, brick by brick, they can be tackled. “One shouldn’t be too intimidated by some of these seeming problems,” Davies said. Obsession: What Liberace Had In Common With Calvin Klein!